Cooking a meal for a large group (family reunion or otherwise) takes planning and stamina. Here’s a handy guide to food quantities and food safety, and advice on organizing a potluck party. The most common form of group comestibles is a potluck feast — which is the cheapest and easiest way to feed a crowd. For potluck meals, every attendee must bring a contribution to the buffet table. You get a wide variety of items from a wide variety of cooks. (You can even swap recipes with some of the other gourmets in your family at the reunion.) Some folks may even bring along old family favorites that you haven’t had since you were a child. What a treat! Hosting a potluck for a crowd does require a bit of planning. 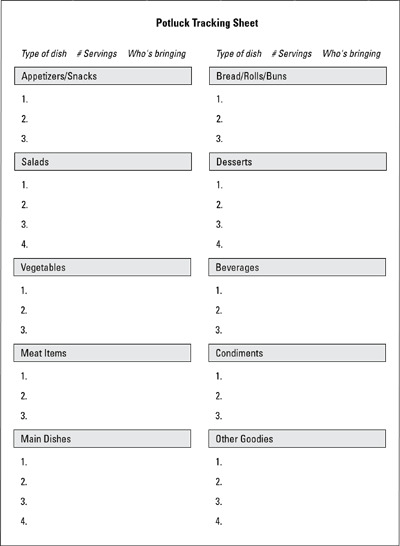 Using a Potluck Tracking List (as shown in Figure 1) can help you keep track of who’s bringing what. The feast can be a real bummer if everyone brings salads and nobody remembers dessert! To simplify the potluck process, you may want to assign each branch of the family a different item. For instance, your Aunt Tilly and her grown children can handle the salads, while Uncle Hubert’s clan can bring main dishes. However, some family members often want to bring special potluck items that they’ve made for years. Whenever possible, try to accommodate them. Sharing these special dishes — and the stories that often accompany them — serve to enrich the reunion experience. Figure 1: Potluck Tracking List. Figuring out how much food to provide can be a challenge. A few family members always require more than the normal amount of food. If your nephew Clyde is a 7-foot-tall linebacker, he likely consumes enough food for a couple of people. The same rule goes for beverages. But there are also family members that will require less food than the normal adult, such as children and some seniors. Here’s the advice: Don’t worry about it. When it comes to potluck meals, there’s always more than enough food! Use the following lists to help you figure quantities of common reunion items. Keep in mind that this information is merely intended as a guide — nothing is written in stone. The amounts are based on 50 attendees. You can easily double or divide the amounts. Ice cream isn’t a practical dessert for a picnic unless you have found a nifty way to keep it frozen. Instead, substitute a few dozen cookies for the ice cream. Be sure to have plenty of ice on hand so folks can refresh their drinks! You can store fresh ice in separate coolers (from the beverage coolers) and refresh the beverage coolers as necessary. Be sure to check your ice stash regularly — it melts pretty fast. If it looks like you’re running low, send someone to the local mini-mart or corner grocery store for a fresh supply. You can also plan a Bring Your Own (BYO) event. BYOs can range from Bring Your Own Beverage (the classic BYOB) to Bring Your Own Everything (BYOE). BYOE guests are expected to pack their own picnics, complete with food, beverages, plates, cups, and utensils. If you decide to host a BYOE, be sure that your guests understand what the term means so they don’t leave the reunion disappointed and mighty famished. When preparing the foods for your family reunion, you need to keep a few things in mind to avoid food-borne illnesses — especially during the summer months when the hot sun beats down on your picnic feast. Keep in mind that harmful bacteria begin to multiply after they reach 40 degrees Fahrenheit. You can’t always determine by sight or smell that food is spoiled. The following guidelines can help prevent the clan from getting Montezuma’s revenge. Keep cold foods cold and hot foods hot. Don’t let cold foods sit without refrigeration for more than 2 hours. If the weather is hot, refrigerate cold foods immediately after serving. Store beverages and foods in separate coolers. The lids to the beverage coolers tend to be opened more often, allowing the cold air to escape. Take only as much meat out of the cooler as you can cook at one time. Keep the remainder in the cooler until you’re ready to cook it. When making chicken and pasta salads, make certain that all ingredients are thoroughly chilled before combining them. Transfer marinated meats to a clean platter — never reuse the platter that held raw meat and marinade without thoroughly washing it. Have plenty of antibacterial wipes or antibacterial liquid soap for guests to use before eating.